Call into your nearest Bob Jane T Mart and the friendly professionals will check your tyres and adjust the air to the perfect pressure. 70% of tyres are wasting fuel because their tyres are under inflated, that’s a free offer you should certainly take advantage of. Bob Jane can help you save fuel and save money! Of course, that’s not the only way Bob Jane saves you money – and have saved Australians money for over 40 years. Their national network sells tyres, wheels and batteries for cars, 4WDs, light trucks and vans. And Bob Jane T Marts perform expert wheel and alignment and wheel balancing using the latest technology. 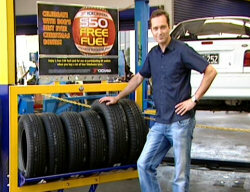 And Bob Jane T Mart has a special offer on Yokohama tyres during November and December. When you buy any four Yokohama tyres, Bob Jane T Mart will give you $50 of free fuel! You not only get yourself 4 fabulous, high-tech new Yokohama tyres at a great price, you’ll also receive $50 worth of petrol in your tank. Bob Jane T Mart helps customers in all sorts of ways – including their Long Life Tyre Plan This plan is free with the purchase of 2 tyres and a wheel alignment and offers a free 3 month or 5,000km alignment and balance check as well as other savings to make your tyres last for longer. Taking tyres for granted is a major cause of accidents. Following Bob Jane T Mart’s advice is easy – and will make you and your family safer out on the road.